WE HOPE NEXT YEAR TO ADVERTISE A PHD STUDENTSHIP. The project is seeking to recruit a postdoctoral researcher, for three years, starting January 2012. We welcome applications from candidates who hold, or are near to completing, a doctorate in archaeology (or have equivalent qualifications or experience) and have experience of archaeological fieldwork in Africa. A good knowledge of French is desirable, as is competency in additional skills such as Geographic Information Systems (GIS) or ceramic analysis. The closing date is 12 noon on 15 August 2011. Please see http://www.uea.ac.uk/hr/jobs/ for more details. Le projet cherche à engage un chercheur postdoctoral, pendant trois ans, à débuter janvier 2012. 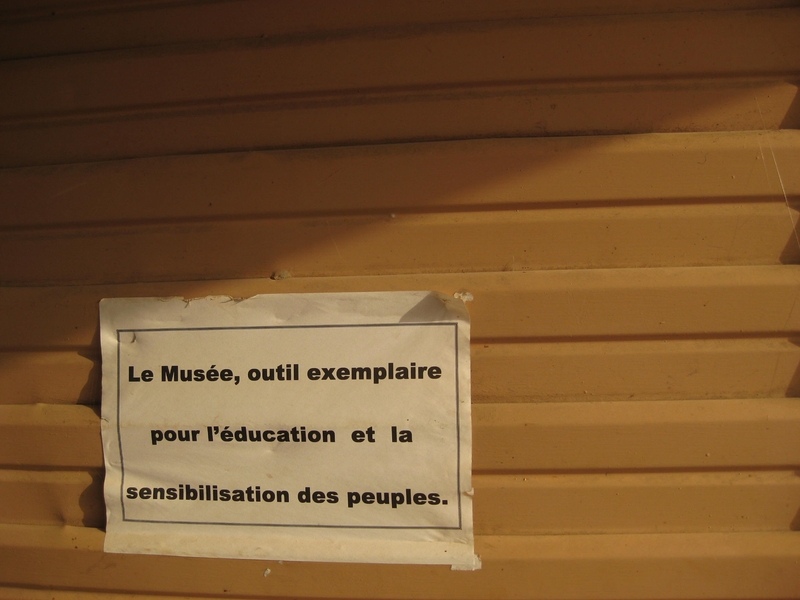 Nous invitons les candidatures de personnes qui détiennent, ou sont près de terminer, un doctorat en archéologie et qui ont expérience du travail archéologique en Afrique. La connaissance du français, ainsi que des compétences en analyse céramique et en SIG, seraient des atouts désirables. Les dossiers sont à soumettre avant le 15 août 2011 à midi. Voir svp http://www.uea.ac.uk/hr/jobs/ pour la procédure. The method has been used for several thousands of years, worldwide. The best known examples are from Japan, Africa, and Europe. The famous Jomon pottery – the first pottery in the world – was decorated using twisted pieces of cord 9500 years ago, as were some types of Bronze Age and Neolithic pottery later on in northern and central Europe. The Romans seem to have used crenellated discs. And, by the way, some of the corn dollies which are one of the ‘specialities’ of East Anglia were made using similar principles (obviously for different reasons though – in that case, to celebrate the harvest festivals, not to decorate pots). This was, thus, a widely used technique, arrived at independently (we assume!) in various parts of the world. As for the African material, here are some examples of roulettes from the collections of the Pitt Rivers Museum in Oxford: the top one is from Sudan, and is an example of a ‘roulette on multiple indpendent cores’: here one (or several) cords have been interlaced around four thin sticks. Find out more about its context of collection on the Pitt Rivers Museum online catalogue entry for this object. 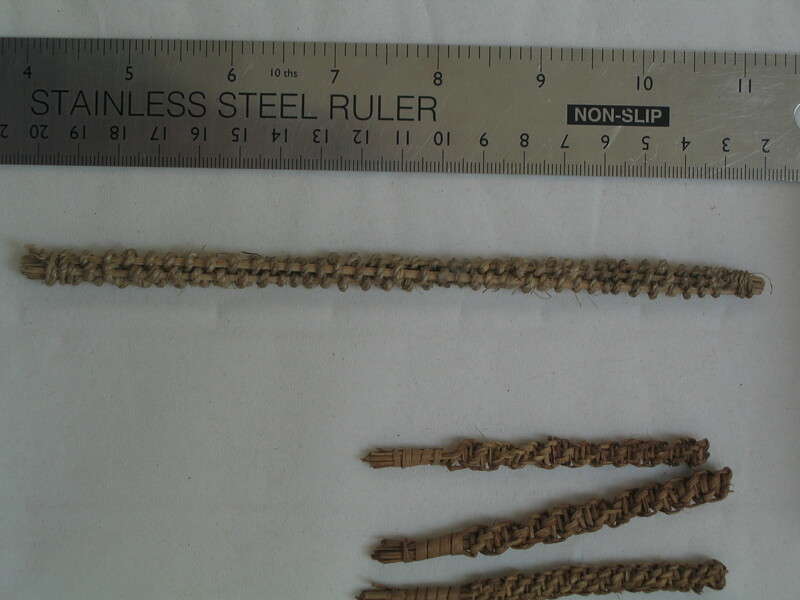 The three at the bottom are from Katsina, Nigeria; they are made by braiding at least five strands or reeds. Find out more about their context of collection on the Pitt Rivers Museum online catalogue entry for this object. 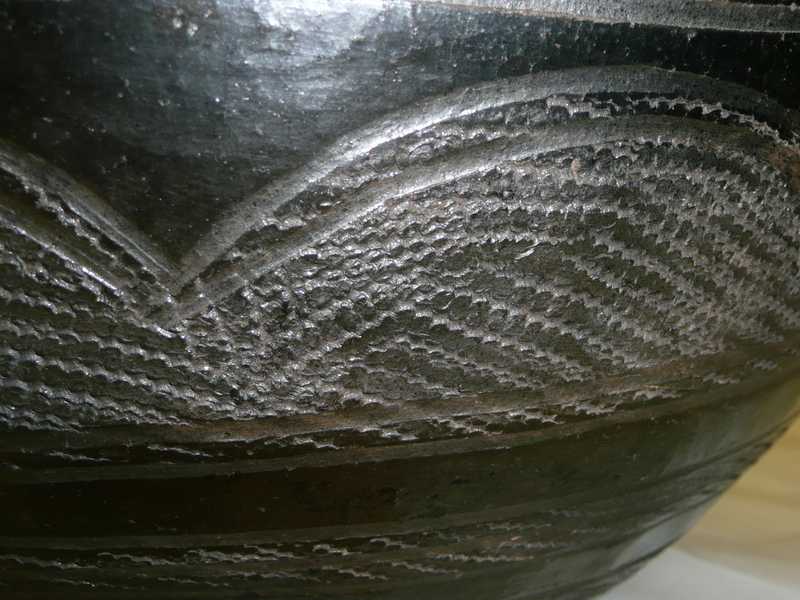 Such tools are rolled or impressed over the surface of the pot before it is fired, resulting in a pattern of convex or concave shapes running in rows. It’s often quite difficult to picture without actually seeing a real example. 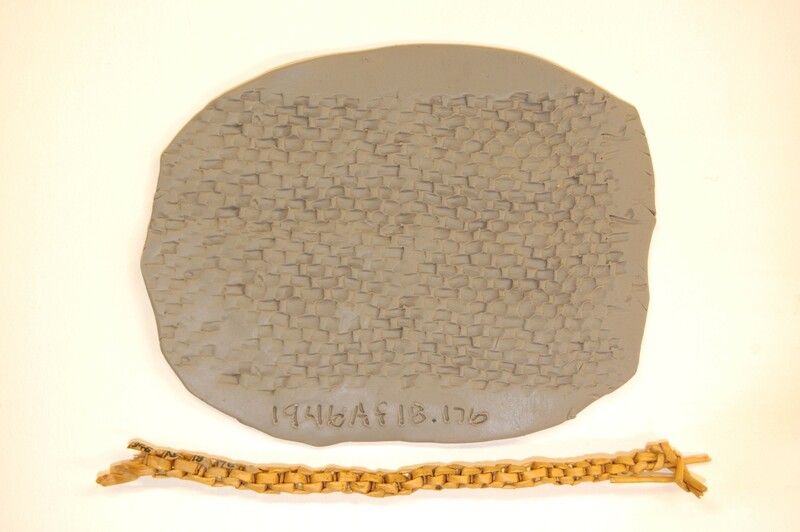 Here is an experimental item, made by rolling a roulette from the British Museum over a blob of clay. 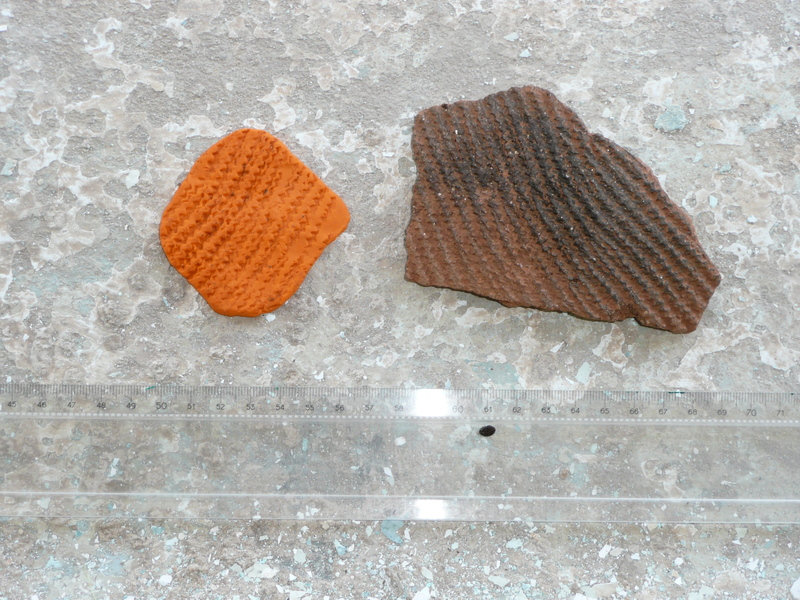 This sherd was once part of a vessel decorated using a braided strip roulette. You can see many more of these examples on our Archaeology Data Service archive, which was put together by a number of colleagues including several of the Crossroads team. In fact, we think roulettes are so nifty that we wrote a book about the things. See also on this blog the separate page Africanist bibliographic resources. Here are an interesting set of thoughts, with thanks to Dr Margit T for mentioning this paper to me. The David Willetts mentioned in my previous post, the Minister for Universities and Science, holds a degree in PPE (Philosophy, Politics and Economics) from Oxford (as do David Cameron, Aung San Suu Kyi, both Miliband brothers, Ann Widdecombe, Danny Alexander, Ed Balls, and Benazir Bhutto, I am informed by the dedicated wikipedia page). The course “brings together some of the most important approaches to understanding the social and human world around us”, says the Oxford Admissions blurb. That seems pretty majorly important and worthwhile. And the course outline provided looks really interesting; optional subjects include Post-Kantian Philosophy, Later Wittgenstein, Politics in Sub-Saharan Africa, Political thought: Plato to Rousseau, International Economics and Economics of Developing Countries. Isn’t PPE generally considered an Arts subject? As such, how is it going to be affected by the phasing out of teaching grants for degree courses in arts, humanities and social sciences at English universities under government plans? I write today from the beautiful Duke Humfrey’s reading room in the Bodleian Library (Oxford). The reading room, which is very The Name of the Rose (but with computers), is the oldest reading room in ‘the Bod’, the original section having been completed in 1487. I have been reading about the activities of the Wangara in the Islamisation of Kano and Borgu, and wholly by chance came across some 1927 maps of Afrique Occidentale Française – one interesting thing being how much more detailed they seem to be for the Saharan regions than for the Sahel father south. I’m in Oxford because I had been invited to deliver a talk to the Medieval Economic and Social History group, which I did last night and very much enjoyed. I spoke about trade diasporas in the medieval Sahel, one of the topics which Crossroads is investigating. Dons at Oxford University have delivered a decisive “no confidence” vote in the Universities minister, David Willetts. There were cheers last night when the vote was announced in Oxford’s Sheldonian Theatre – the first time a “no confidence” motion had ever been issued in a government minister by the university’s Senate. It was carried by the massive margin of 283 votes to five. During the debate, Abdel Takriti, a tutor at St Edmund Hall, called the Government’s plans for further education – under which student fees would rise to up to £9,000 a year – “ill-articulated and incoherent”. I learnt last night that following that vote, a website has now been created on the back of that vote to coordinate motions of no-confidence at higher education institutions across the country: “Campaigning for an alternative to the Higher Education policies of the coalition government”. Check it out. In Russia, it is common knowledge that the country’s greatest poet, Pushkin, was descended from an African who was raised to high rank by Czar Peter the Great. Research done by Beninese historian Dieudonné Gnammankou led him to conclude that this great-grandfather most likely began life as the son of a chief in the sultanate of Logone-Birni, Cameroon. A 1,700-year-old skeleton shows that people of African descent have lived in Warwickshire for far longer than was previously thought. Archaeologists said they now believed the man may have been a Roman soldier who chose to retire in Stratford after serving in an African unit.